The shortlist for the 2016 Manly Wade Wellman Award for North Carolina Science Fiction and Fantasy has been announced. The award, given by the North Carolina Speculative Fiction Foundation, recognizes outstanding science fiction and fantasy novels written by North Carolina authors. The winner is selected by a vote of members of sf conventions held in the state: illogiCon, ConCarolinas, ConTemporal, and ConGregate. Eligible voters can participate by submitting a voter registration form by July 1. This year’s winner will be announced July 16 at ConGregate in High Point, North Carolina. This entry was posted in Awards and tagged Manly Wade Wellman Award by Mike Glyer. Bookmark the permalink. Ooo! Congratulations to oor wombat! Darin Kennedy owes my Jr. High english teacher a note of thanks. Bought and can’t wait to see where this goes. Hope that oxcart misses the old man’s legs this time. Oor Wombat is clearly the best, even if she doesn’t win. Made the ballot with a kid’s book! Against all that grimdark. Hee! 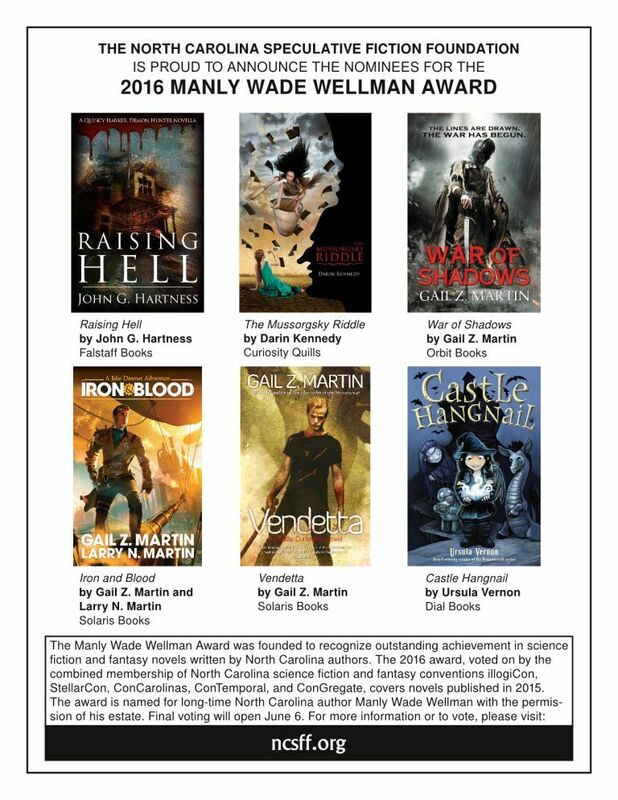 It’s an honor to be nominated of course, but yeah, that cover does look a little out of place there, doesn’t it? Congrats on being nominated and yeah your cover looks a little out of place but I do love it.